Welcome! 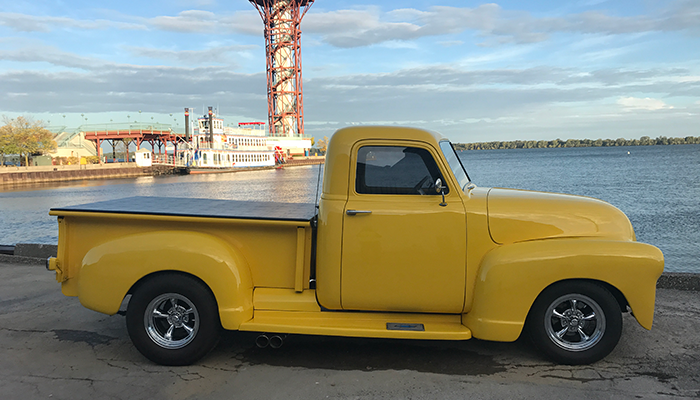 For four generations and 100 years, Dias Spring Service has been Erie’s full service automotive and truck repair facility. Thank you for your business... and your trust! For 4 generations and nearly 100 years, Dias Spring Service in Erie, PA, has been known for expert wheel alignment and suspension repair. 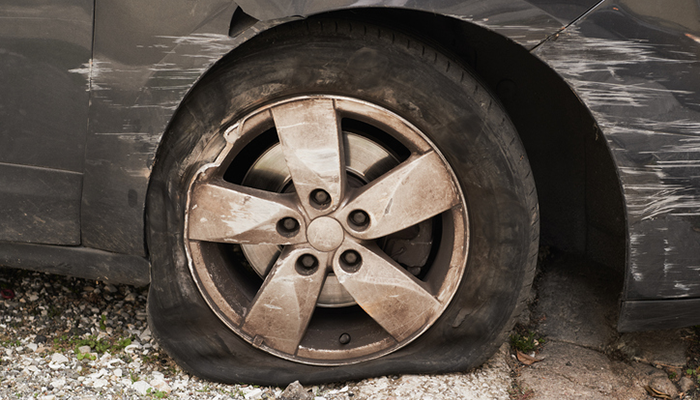 We’re the only automotive service facility in the tri-state area with the capability to offer professional alignment service for all of the following vehicles: cars, trucks, motor homes, limousines, tractor trailers, buses, RVs, camper and utility trailers. We also specialize in antiques, classics and street rods! We’re More Than Alignment & Suspensions! Dias Spring Service is and always has been a full service automotive and truck repair and maintenance facility. In addition to handling PA State Inspections and Emissions, we offer a wide variety of services to help keep you and your vehicle safe, dependable and working at its best! Brakes, Oil Changes, Cooling Systems Flush, Shocks & Struts, Wheel Balancing, Rim Repair & Straightening, Total Vehicle Alignment, Suspension Repair & Upgrades, U Bolts - Standard & Custom, Leaf & Coil Springs Repair/Replace, Preventative Maintenance, King Pins. Dias Spring Service is your best resource for heavy duty truck parts, repair and maintenance service. We’re a manufacturer distributor for Dayton Parts, Triangle Suspension Systems, Baldwin Filters, Imperial Fasteners, Grote Lights, Trucklite, Timbren Rubber Springs, Airlift Suspension Systems, Stempf Automotive, Redneck Trailer Parts, Euclid Industries, CR Seals, Onspot Tire Chains. Our hundred years of experience and long-term relationships with parts manufacturers enables us to offer excellent parts and labor pricing. We’re proud to offer hometown, personalized service and parts prices that are less than most truck dealers. You can depend on our qualified, experienced parts and service team to help you get the best quality part at the most competitive price. We specialize in heavy duty truck repair and maintenance service! Why go anywhere else? We accept: MC, Visa, Discover. 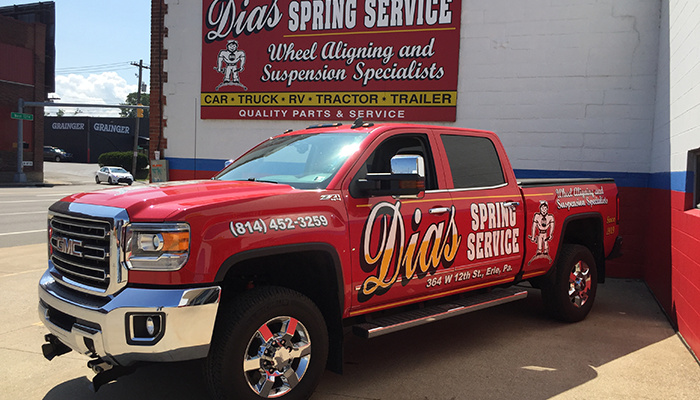 Dias Spring Service full service automotive and truck repair and maintenance facility is conveniently located at 364 West 12th Street in Erie PA. Bent or broken rim? Save yourself time and money! Don’t replace it, repair it. Dias Spring Service offers rim straightening for both steel and aluminum rims. Call us first 814.452.3259. Unique or unusual vehicle? 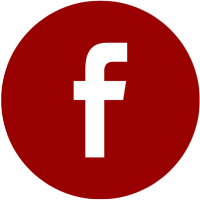 We specialize in alignments and suspensions for antiques, classics and street rods.